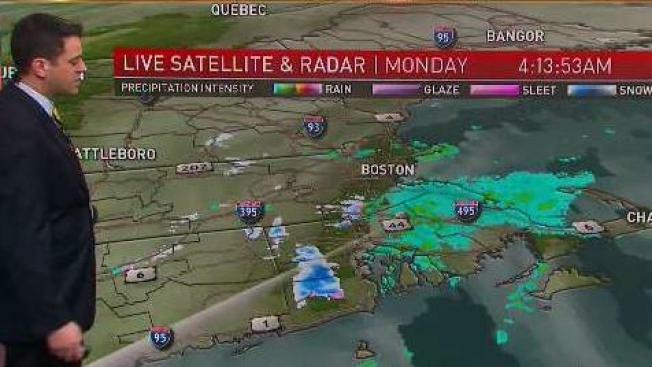 A messy storm cranked out rain and sleet as it tracked southeast of Nantucket overnight. Sleet (or ice pellets) actually started piling up in Southern New Hampshire before the cold air swarmed in and switched it to snow. That snow slowly dropped south into Massachusetts, setting the stage for some slushy accumulations and slick travel on the side streets and secondary roads. Generally speaking, however, the roads were wet and not white, sparing us a really nasty morning. That storm is spinning away Monday morning. Leftover nuisance snow, or light showers, will depart no later than mid-morning as the storm pulls away. Sun will return along with a gusty northwest wind. This will eventually draw down some significantly colder air Tuesday, along with more strong wind. Expect wind chills to bottom out in the teens as highs struggle to make freezing. That cold is short-lived as Wednesday sees us nudge 40 in some spots. Temperatures continue to warm as the week progresses, soaring to the upper 50s as a strong, mild storm pulls into town by the end of the week. It’s an odd way to herald the arrival of winter, but then again, this is New England. The weather never follows the calendar.